Please click to enlarge the above image. 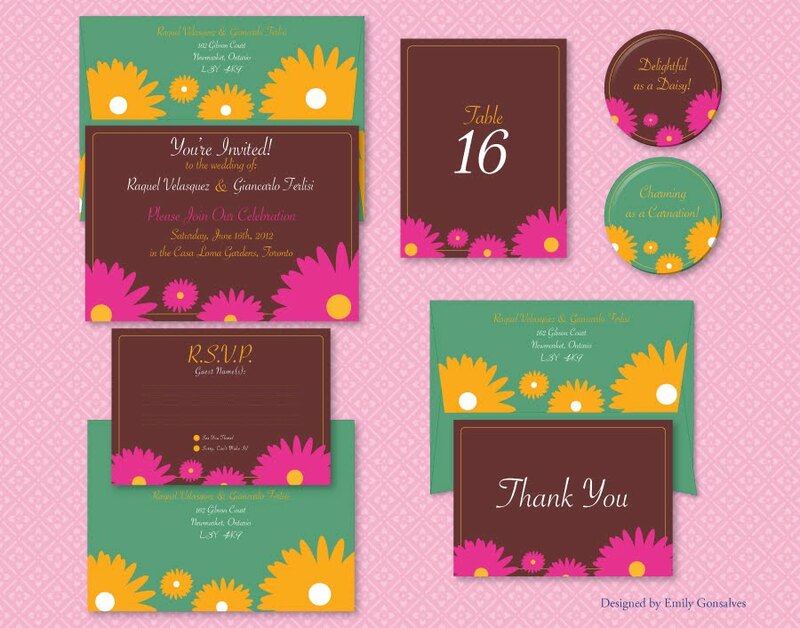 This is a wedding template suite that I designed around the theme of “spring blooms.” The set includes standard pieces as well as customizable buttons that can be worn at the event or used later as small keepsakes. The button design can also be used for keychains and magnets, if anyone would like to see those added. I’m also considering the addition of a custom printed tote bag to this set, for my Zazzle shop customers. Anything else you’d like to see, just let me know! This is a more playful suite that works well for a more casual event, be it a wedding or a party. Although the invitations, reply cards, and thank you cards come with plain envelopes, designed envelopes are available separately. If you’d like to see different envelope sizes to use for regular stationery, just let me know and I’ll create more envelope sizes. Invitation (top left) – 7″ x 5″, most text customizable. One field each for bride’s and groom’s names, and a multi-line field for the details. A7 envelope (top left, underneath) – 7.25″ x 5.25″, fits the invitation and postcard. RSVP card (bottom left) – 5.5″ x 4.25″, all text customizable. Includes blank lines for invited guests to fill in by hand and circular checkboxes to confirm attendance. Small envelope (front: bottom left, underneath and back: bottom right, underneath) – 6.5″ x 4.7″ (A6). Fits reply card and thank you card. Customizable text for both the to and from addresses. Postcards (top centre) – all text customizable, blank back. Uses one size of white text on Zazzle, with eight lines available to allow customization for a variety of purposes. Can be used for an alternative invitation option or table numbers. Brown buttons (top right) – available in multiple sizes from 1.25″ to 6″ diameter, default size is 2.25″ diameter. Two lines of customizable text available. Text can be modified to use a guest name, a table number (or table name), or even a short saying. Green buttons (top right, below the brown buttons) – available in multiple sizes from 1.25″ to 6″ diameter, default size is 2.25″ diameter. Two lines of customizable text available. Text can be modified to use a guest name, a table number (or table name), or even a short saying. Thank you cards (bottom right) – 5.5″ x 4.25″. No customizable text. Inside is blank for handwriting personal notes. If you or anyone you know may be interested in having pieces custom designed for a wedding or other special event, you can see my special event design website for more information. Please also get in touch if you would like me to assist you in creating items for your special day. It's nice of you to provide these for those looking for budget-conscious inspiration. These are for sale, the primary purpose of sharing the info here is so people can see the whole set at once and consider if they would like to buy any of the pieces. The pieces are available with customizable text via my Zazzle shop. Inspiration though, that can come from anywhere!